The first Jews to arrive in Australia came as British prisoners in the 18th century. Today, Australia's Jewish population stands at approximately 112,000 - the ninth largest Jewish community in the world. The majority of Jews in Australia reside in the major cities of Sydney, Melbourne and Brisbane. When the American colonies revolted in 1776, England lost its biggest prison – convicts were routinely shipped to the thirteen colonies to make room in the perpetually crowded British jails. As a result, England annexed the island of Australia in 1788 as a new prison colony. While Australia had been known to Europeans since its discovery in the sixteenth century, the English were the first to settle there on a permanent basis, aside from the native Aboriginal population. Among the 1,500 prisoners who initially arrived in Australia where 16 Jews; by 1817, more had arrived, and enough had been freed to form an organized minyan and burial society. As their numbers swelled, primarily due to immigration from England and Germany, kehillahs (organized communities) sprang up in the cities of Sydney (1831) and Melbourne (1841), which were to become the two centers of Jewish life. The Sydney kehilla was founded by Joseph Barrow Montefiore, a cousin of Sir Moses Montefiore. The Sydney congregation worshiped in houses and shops until 1844, when the growing community built the first synagogue in Australia. It was soon followed by synagogues in Hobart (1845), Launceston (1846), Melbourne (1847), and Adelaide (1850). The gold rush of the 1850s attracted more Jewish immigrants, so that foreign-born Jews soon outnumbered the native-born. Many of the immigrants initially settled in rural locations, and not in the main, urban communities of Melbourne, Sydney, Perth, and Adelaide. Fear of assimilation, however, caused most Australian Jews to consolidate in cities by the end of the century. 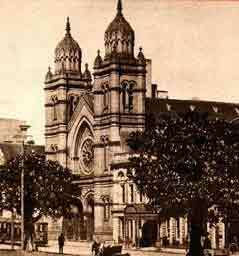 Consequently, the rapidly growing Sydney community soon needed larger facilities, and in 1878 built the Great Synagogue, which was widely considered the most impressive place of worship in Australia. Australia remains to this day the only country in the world, other than Israel, whose founding members included Jews. As a result, Jews were treated as equal citizens from the outset. In contrast to contemporary Europe, incidents of anti-Semitism were very rare in Australia. Jews were free to participate in economic and cultural life, and played an important role in their development. The first Australian theater, for example, was built by a Jew, and an early Jewish composer, Isaac Nathan, has been described as the "father of Australian music." Jews also served as elected officials. In the nineteenth century, prominent Jews included the mayor of Melbourne, premier of the state of South Australia, speaker of the House of Representatives, and speaker of Parliament. Interestingly, these political leaders were frequently the heads of their respective kehillas as well; unlike the politically autonomous kehillas of Europe, Australia's communities were cultural and religious institutions only. The seamless integration of Jews into Australia allowed them to flourish in all spheres but religion. The Jews' incorporation into society led to a rise in intermarriage, a drop in synagogue attendance, and a lack of affiliation with Judaism in general. Nonetheless, there were still those who maintained their observance. The communities remained affiliated with the British Chief Rabbinate, and founded numerous Jewish schools and synagogues. In addition to the Ashkenazim who comprised the vast majority of Australian Jewry, a small Sephardic community thrived during the mid-to-late nineteenth century. For some twenty years there was a Sephardic congregation, and such prominent families as the Montefiores occupied important communal positions. Gradually, however, the Sephardic population decreased, and the congregation was disbanded by 1873. At the end of the nineteenth century and the beginning of the twentieth, as Australia was unifying its colonies into one independent nation, a wave of immigration from Europe bolstered the Jewish community both in terms of numbers and observance. Refugees from the pogroms in Russia and Poland came in the 1890s, and brought an infusion of tradition to the assimilated communities. Following World War I, another stream of Jews arrived in the country, and when Hitler came to power in Germany in 1933, that stream became a flood. The Australian government was initially hesitant about opening its gates to so many immigrants, but in 1938 decided to allot 15,000 visas for "victims of oppression." Some 7,000 Jews took advantage of the visas before the outbreak of war in 1939. The influx of immigrants led to a split among the urban Jewish centers. Most of the Jews who lived in Sydney were from Western and Central Europe. These Jews tended to be more secular than their Eastern European counterparts, who, by and large, settled in Melbourne. As a result, Sydney became known for its secular Jewish population, and Melbourne for its highly Orthodox community. At the same time, Perth also became primarily Orthodox as thousands of observant South Africans arrived. But if the German and Hungarian immigrants were secular in comparison to the Russians and the Poles, they were still far more religious than the Australians. Thus, even those Australians who remained non-Orthodox gradually became more involved in communal affairs. The previously synagogue-oriented kehillas began to focus their energies more on education, Zionism, and combating anti-Semitism, allowing even the irreligious to become involved. By the end of World War II, the community was very united in its opposition to assimilation, and was gradually becoming more observant of ritual and doctrine. In the aftermath of the war, even more European Jews arrived in Australia, mostly from displaced persons camps. The trend toward observance continued to grow, especially once the Lubavitch movement gained a foothold, and day-school attendance rose steadily. The growth of the thriving community was briefly interrupted in the 1970s, when a rise in intermarriage caused an unprecedented decrease in the total Jewish population. By the early 1980s, however, a census indicated that the Jewish population was once again growing, and that intermarriage had once again dropped to one of the lowest levels in the diaspora. Immigration did not let up, and, in 1989, the flow of primarily South African immigrant was augmented by refugees from the newly disbanded Soviet Union. The long dormant Sephardic community was also revitalized in the post-war period. Since the original community’s demise in the late 1800s, Sephardim had a difficult time gaining entry to Australia due to the racist White Australia Policy instituted by the government. In 1956, following the Suez crisis in Egypt, the government began to allowed select Egyptian Jews to enter the country. In ensuing years, pressure from the Jewish communities caused the government to drop its anti-Sephardic stance. By 1969, when the Iraqi government began to target the Jews for persecution, Australia allowed any refugee who could come to Australia to do so. Today, between 115,000 and 120,000 Jews live in Australia, out of a total population of over 20 million. The Jewish community of Australia is the largest Jewish community in the East Asian Pacific Region. 80 percent of Australian Jews live in Melbourne (50,000) and Sydney (45,000), but there are also significant communities in Perth, Brisbane, the Gold Coast and Adelaide. Melbourne is still considered the more religious of the two cities, with about 80 percent of its Jews declaring themselves traditional. 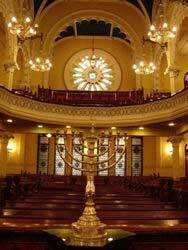 Nonetheless, Sydney boasts numerous synagogues and Jewish organizations as well, and a very high rate of aliya. The Executive Council of Australian Jewry (ECAJ) is the elected representative organization of the Jewish community. Overall, there are 81 synagogues and 18 day schools in Australia, and several Jewish newspapers and periodicals. More than 50 percent of Jewish students are enrolled in Jewish schools, which is the highest rate anywhere in the world with the exception of Israel. Australia also has a low rate of intermarriage compared to other Diaspora countries. There have been two Jewish Australian governors-general and several Jewish Australians have served in senior leadership positions in the country’s military. An agreement was announced between the governments of Israel and Australia on October 22, 2014, to provide for more economic and cultural cooperation between the two countries. The agreement is a “Holiday & Visa” agreement, which will make it easier for young Israelis to work and vacation in Australia, and vice-versa. Under the agreement 500 work-travel visas will be awarded each year to Israelis and Australians between the ages of 18 and 30, and the individuals will be able to stay in the other country for a full year. In addition to Australia, Israel also has similar arrangements with Germany, New Zealand, South Korea, and others. Australia and the United States sided with Israel’s safety and security in December 2014 when they were the only two countries on the UN Security Council to vote against a Palestinian statehood resolution that would have required Israel to relinquish its territory captured after the 1967 war. The Palestinian statehood measure was brought before the Security Council by Jordan on behalf of the Palestinians, and needed nine yes votes out of the fifteen members of the Security Council in order to pass. The United States and Australia voted against the measure, while Nigeria, Britain, Lithuania, the Republic of South Korea and Rwanda abstained from voting. The measure did not meet the required number of votes, garnering eight “yes’s” instead of the nine required to pass. The eight countries that voted in favor of the resolution were China, France, Russia, Argentina, Chad, Chile, Jordan, and Luxemburg. This vote marked the first time that Australia had voted “no” on a proposed resolution during their two year term on the Security Council. Avi Hasson, chief scientist of the Israel Ministry of Economy, made his first official visit to Australia in late November 2015. Hasson met with Australian business leaders and government officials, seeking to increase economic, scientific, and technological cooperation between the two countries. A research & development agreement was signed between Hasson and the Commonwealth Bank of Australia during the visit. Australia’s Minister of Foreign Affairs, Julie Bishop, received the Hebrew University’s Torch of Learning award and delivered a speech titled “The changing face of the political landscape in Israel, the Middle East and in Australia,” in Sydney, Australia, on November 22, 2015. Benjamin Netanyahu became the first sitting Israeli prime minister to visit Australia on February 22, 2017. Australian Prime Minister Malcolm Turnbull welcomed Netanyahu at a press conference in Sydney, where Netanyahu lauded Turnbull’s opposition to a recent anti-Israel UN Security Council Resolution. Australian Energy and Environment Minister Josh Frydenberg signed a Declaration of Intent with his Israeli counterpart Ze’ev Elkin on April 25, 2016, which called for cooperation on multiple environmental issues. The representatives signed the declaration during a three-day visit by Frydenbeg to Israel, promising to work together on sewage treatment, water and air quality, greenhouse gas emissions, climate change, biodiversity, clean energy technology, and coastal preservation. Australian Prime Minister Malcolm Turnbull travelled to Israel in October 2017. “Israel and Australia have a vital interest in working more closely and intensely together to keep our people safe from terrorism,” Turnbull said, after signing a Memorandum of Understanding on mutual defense. The Australian government announced the suspension of all foreign aid to the Palestinian Authority on July 1, 2018, due to the fact that the funds would likely be used to pay Palestinian terrorists and their families. Israel’s Rafael Defense Systems won a bid in May 2018 to provide missiles for Australia’s Boxer armored fighting vehicles. In August, Rafael signed an industrial cooperation agreement with Australian company Varley, creating a jointly owned company to be known as Var. The cooperation agreement provides for the establishment of production lines in Australia for Rafael’s Spike anti-tank missiles, as well as the sale to the Australian military of the Trophy system for protection of tanks and APCs, the Iron Dome missile defense system, and the Iron Dome anti-torpedo system for protection of vessels at sea. Today's Jewish community is concentrated in the St. Kilda district, home of the Melbourne Hebrew Congregation, the oldest and largest synagogue in the city. The original kehilla that was formed in 1841 moved into this large, stately building in 1930, and the dome-topped, Victorian structure has been in use ever since. Other synagogues in Melbourne include Temple Beth Israel, a Liberal synagogue that seats more than 2,000 people; the St. Kilda Hebrew Congregation, which is more in the old-world style; and the Kew synagogue, the newest and most modern looking temple. The Jewish museum of Australia displays Judaica, ritual objects, Holocaust material, and paintings and sculptures by Jewish authors. The nearby Kadimah Cultural Center shows Jewish and Yiddish drama, and has a large library of Judaica. There are also kosher restaurants and grocery stores throughout the St. Kilda area. The most important Jewish sight in Sydney is the Great Synagogue. 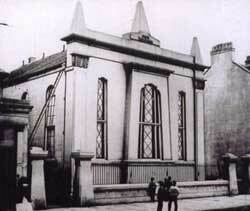 Built in 1878, the imposing building is one of the most spectacular synagogues standing today. Its four-story pointed towers, arches, and stained glass clerestory are prime examples of Victorian architecture. The building also houses a Jewish museum and library. While the Great Synagogue is located in the center of the city, most of Sydney's Jews live in the Bondi and North Shore suburbs. Bondi features the Hakoah Club, a Casino with a kosher dining room that is reminiscent of Atlantic City. The area, which overlooks the ocean from a towering cliff, also features kosher restaurants, a Lubavitch yeshiva, and several synagogues. The North Shore Synagogue, established in 1947 by German immigrants Reverend William and Rosalie Katz, is a modern Orthodox community situated in the Lindfield area of Sydney. Known as the "Garden Synagogue" for its beautiful surroundings, the synagogue is within a garden of tall Australian trees. North Shore Synagogue holds regular services, as well as services for Shabbat and festivals, has a Hebrew School and a B'nai Mitzvah program, and has over 850 famillies in its congregation. Next door is the local Jewish day school's junior school of Masada and the senior school is a few minutes up the road in another Jewish suburb on the north shore, St. Ives. The recently built Museum of Australian Jewish History and the Holocaust is located in Darlinghurst. It includes exhibits on the convicts who founded Sydney's Jewish community, and a recreation of George Street in central Sydney where a numbr of Jewish businesses were located in the mid-1800s. Its foundation stone laid on August 9, 1843, the Hobart Synagogue in Hobart, Tasmania, Australia is the oldest synagogue in Australia. It was designed by James Alexander Thomson, a Scotsman originally sent to Australia in 1825 for attempted jewel robbery, in the Egyptian Revival Style. The Egyptian style represented antiquity and the synagogue’s design was meant to indicate Judaism’s ancient roots. 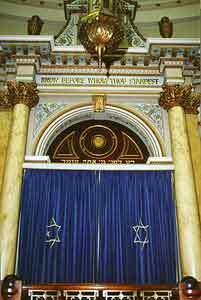 The synagogue’s entrance is decorated with two carved pillars supporting an architrave and cornice, upon which appears the Hebrew inscription from the Book of Exodus: “Wherever my name is mentioned there will I come and bless you.” The synagogue’s Ark is enclosed by a light and elegant bronzed railing and is approached by circular steps. On either side of the doors of the Ark, which are richly carved and gilded, are placed two elaborately carved pillars, supporting an entablature and cornice of cedar, which is also gilded. The Hobart Synagogue Ark contains multiple Torah scrolls thought to be as old as the synagogue. One of these scrolls was donated by Lady Rachel Ezra of Calcutta, India, though it is probably of Syrian origin, in 1951 and is kept in an ornamental silver casing in the Sephardi style. On display is a Memorial Sefer Torah from Czechoslovakia that is one of the 1,564 scrolls seized from desecrated synagogues by the Nazis. The synagogue is currently shared by an Orthodox and a Progressive group and, since 1956, there has not been permanent rabbi in residence so the congregation depends on members who have received traditional Jewish instruction for leadership. 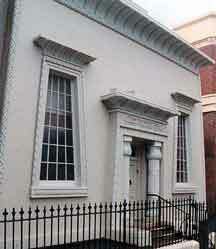 The Hobart Synagogue is the oldest synagogue in the southern hemisphere still in regular use. Sources: Original article by David Shyovitz. Jade Macmillan, “Government recognises West Jerusalem as Israel's capital but keeps embassy in Tel Aviv,” ABC News, (December 16, 2018).